President Recep Tayyip Erdoğan on Saturday called for Turkish scientists living abroad to make their way back home in an attempt to establish the reversal of the country's brain drain amid increased efforts to become a technology-producing country. "We are launching a campaign to bring our science people back home. I call on our scientists in all parts of the world to join the science and technology movement," Erdoğan said at Turkey's first aerospace festival' Teknofest. Dressed in an air force uniform and escorted by F-16 jets, Erdoğan landed at the new airport to join the event on Saturday. "Students whom we sent to study engineering in the West mostly returned ... with their minds deluded," Erdoğan said, pledging state backing for new projects, especially in the defense industry. There was a 42.5 percent increase in the number of Turkish citizens emigrating from Turkey overseas in 2017, according to the Turkish Statistical Institute (TurkStat). Istanbul saw the highest number of emigrants with 75,849 people, while Ankara followed with 27,379. Among foreign emigrants, Iraqis once again ranked first with 20.4 percent, followed by Azerbaijanis, Syrians and Afghanis, making up just under 8, 7 and 5 percent, respectively. 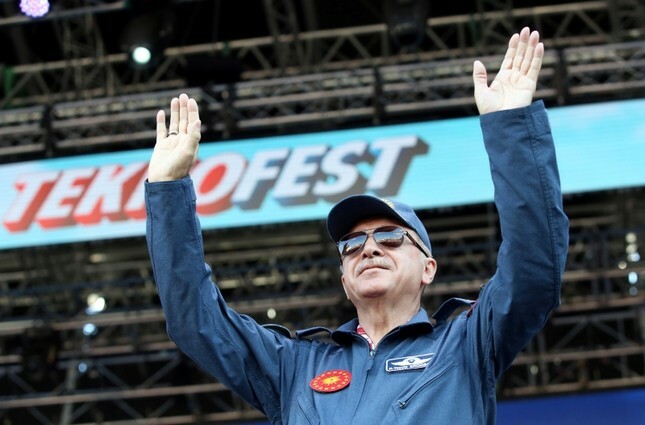 Erdoğan's comments come as Turkey holds its first aerospace and technology festival Teknofest in Istanbul. ​The festival, organized by the Turkey Technology Team Foundation (T3) and the Istanbul Metropolitan Municipality, aims to promote and to showcase Turkey's rapid advance in technology on September 20-23 at the city's new airport. Nearly 80,000 people have registered for the festival so far. The festival kicked off on Thursday and features air shows, aviation demonstrations, technology competitions, seminars on cutting-edge technology, and an international entrepreneurship summit, along with other activities. As part of the festival, the leading Turkish defense and technology institutions and corporations such as Aselsan, Baykar, IGA, Isbak, Roketsan, TAI, Turkish Airlines, TUBITAK and TURKSAT will organized competitions in 12 different categories.